Unique Website offers need-to-know information and support about genetic testing. Many cancers can be linked to hereditary gene mutations that pass from generation to generation. Genetic testing is used to verify an individual as a carrier of a specific genetic mutation, and then determine if family members should be tested for the same hereditary cancer syndrome. Hereditary Breast and Ovarian Cancer (HBOC) syndrome is caused by an inherited BRCA1 or BRCA2 gene. Lynch syndrome, or hereditary nonpolyposis colorectal cancer (HNPCC), is most often caused by a mutation in the MLH1, MSH2, MSH6, PMS2, or EPCAM genes. It is important to verify that a patient carries a gene mutation since such mutations dramatically increase the risk of developing cancer. Genetic testing can determine the risk of developing hereditary cancer before it develops; this information is critical in planning strategies for early detection and treatment. Genetic testing is integral to hereditary cancer risk assessment. The American Society of Clinical Oncology recommends that genetic testing be offered when an “individual has personal or family history features suggestive of a genetic cancer susceptibility condition…or when the results will aid in the diagnosis or influence the medical/surgical management of the patient or family members at hereditary risk of cancer.” (J Clin Oncol 2003; 21(12)). genes related to Lynch syndrome. COLARIS does not determine whether a patient has cancer; it actually determines if the patient is at an increased risk for cancer. COLARIS and BRACAnalysis tests require an evaluation of personal and family history, along with a small sample of blood or mouthwash. Patients should be familiar with family history to determine whether a genetic mutation runs in the family. March is Colon Cancer Awareness Month. It is important to get screened for colon cancer, especially if an individual has a family history of colon cancer or Lynch syndrome. Medical guidelines recommend having a colonoscopy every ten years or a flexible sigmoidoscopy every five years beginning at age 50. 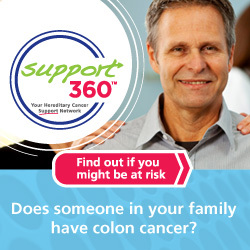 Risk factors for colorectal cancer may be related to age, lifestyle, or family history. Myriad Genetics is a healthcare company focused on the development and marketing of novel molecular diagnostic products. We are committed to improving patient healthcare through the commercialization of predictive medicine, personalized medicine, and prognostic medicine products.